How many wheels are there altogether? The students wrote a multiplication equation, estimated, and then figured out the answer. We discussed their different strategies for computing and agreed that 7 x 3 = 21. I then gave a related assignment. 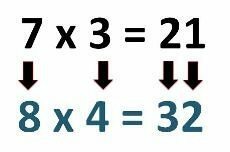 This time I presented the students with a multiplication equation―8 x 4 = ? I asked them to estimate the product, write a word problem that matched the equation, and figure out the answer in at least two different ways. As I circulated, Lydia was eager to explain to me how she had arrived at the estimate of 32. She had noticed that one less than each of the factors in 8 x 4 resulted in 7 x 3, the factors in the tricycle problem we had solved. So she figured that the answer to 8 x 4 should follow the same pattern, and she changed 21 to 32. Here’s what she wrote. Lydia happily continued with the assignment. She wrote an appropriate word problem―There were 8 dancers. Each dancer held 4 canes. How many canes all together? When she solved the problem (she did this in five different ways), she was pleased that her estimate was the exact answer. Meanwhile, I was wondering about what Lydia had done and why it had worked. I grabbed a piece of paper and tried her method on other problems, increasing each factor and the digits in the product by 1 . It didn’t work the first few times, but then it worked again! I returned to Lydia and asked her to try her method on 6 x 2, a problem I knew wasn’t too hard for her to figure. Also, the factors were each 1 less than in 7 x 3, so it related back to the tricycle problem. Lydia wrote 6 x 2 = 12 and, underneath, increased each digit by 1, producing the incorrect result that 7 x 3 = 23. “Hey,” she said, “it wouldn’t work. I don’t get it. It worked over here.” She referred again to how she had estimated 8 x 4 from 7 x 3. While I found Lydia’s conjecture surprising and intriguing, I discounted it as just a lucky occurrence . . . until I investigated further. My challenge was to make sense of the mathematics from a pattern that was orderly but seemed based solely on luck. I spent a good deal of time that night trying Lydia’s method on problems with different pairs of factors, looking for patterns relating to when her method did and didn’t work, and trying to figure out why. Nicholas and I talked several times. I love investigations like these, where the math isn’t particularly difficult or complex so the problem is accessible, but there’s something mathematically wonderful, and often surprising and delightful, to discover. I’m now convinced that Lydia’s reasoning indeed has mathematical grounding, that it’s possible to predict when her method will and won’t work, and to be able to explain why. Interested in finding out more? Try these investigations. The investigations below helped me make sense of the mathematics underlying Lydia’s method. I’ve used the first two suggestions with third, fourth, and fifth graders. Having choices about what to investigate and how is effective for motivating and encouraging learning. More recently, I put together the full list of investigations for a professional learning session. Teachers were free to investigate some or all of them, and in any order. Then, after everyone had some time to think by themselves, I organized them into areas in the room numbered for the seven suggestions. They had the choice to continue working on their own or to join a group that was focusing on the same question. It was OK for them to switch to another group as they worked. I think that having choices about what to investigate and how is valuable, both for professional learning sessions and in classrooms with students. I think this would be a good set of investigations and structure for a middle school or high school class. Does Lydia’s method work for other pairs of equations? Why? What can you discover about pairs of equations for which it does and doesn’t work? How might using rectangular arrays inform the problem? What about adding 2 to each digit (or any other number) instead of adding 1? How can you use algebra to explain what’s happening? What happens with negative factors? What about factors that aren’t whole numbers; e.g., 2.6 or 3.05? As always, I’m interested in any feedback and/or questions.